The SA government has been working in the background to ensure that trade arrangements with the UK and EU are uninterrupted while the UK exits from the EU, the portfolio committee on trade and industry heard on Wednesday. The committee was briefed by the Department of Trade and Industry (dti) on Wednesday on the progress made in the trade arrangements pending the outcomes of Brexit. The UK Parliament will on Wednesday vote whether it will leave the EU without a deal, after members of Parliament voted against Prime Minister Theresa May’s latest deal on Tuesday. On Thursday, the UK Parliament is expected to vote on whether to extend the Brexit deadline. The dti told the committee that on Friday, a meeting would be held between Mozambique, the UK and the Southern African Customs Union – of which SA is a member – to iron out two outstanding issues relating to the existing trade agreement, known as the SADC-EU Economic Partnership Agreement (EPA). The current arrangement will no longer apply to the UK once it leaves the EU. According to dti deputy director general for international trade and economic development, Xolelwa Mlumbi-Peter, two key areas will be affected by the rollover of the SADC-EU EPA. The first is known as cumulation, which allows a country to source inputs from elsewhere for production, and then allows for the finished product to have preferential market access. For example, engines from Britain are currently imported for cars produced in SA, and eventually exported to the EU. Currently, with the UK and EU being considered "one party" to the SADC-EU EPA, it means that the UK can source inputs from other members of the EU, and export products to SA. In turn, SA has an existing value chain, where inputs from the UK are imported for products to be exported to the EU. "Because of history with EU countries and the fact we have been trading with countries for a long time, we have existing value chains that need to be preserved for both parties. It is for the benefit of both parties for us to be able to continue trade," Mlumbi-Peter said. It is important for SA to treat both the EU and UK in the same way, as it observes the obligations of the SADC-EU EPA, Mlumbi-Peter explained. "We can’t agree to treat the UK better than the EU under the current agreement. If you negotiate better treatment, then you are [introducing] new terms, and it will no longer be a rollover of the EPA," she said. The contention is that the UK is requesting better treatment than what the EPA provides for. The UK wants to cumulate on products, which the EU currently cannot cumulate on, Mlumbi-Peter explained. SA has informed the UK that this is beyond the existing agreement and this matter should be raised after Brexit is concluded, when new trade arrangements are developed between countries. "We have given the UK a proposal to allow the UK and EU to be treated the same, for us to cumulate under similar terms under the SADC-EU EPA," she said. It has been proposed that cumulation should be allowed for products where the duty is the same for the EU and the UK. Where the duty is lower, this will ensure no chance of circumvention, Mlumbi-Peter said. The UK has undertaken to discuss this domestically before meeting with ministers of the SACU and Mozambique on Friday. A second key issue affects agriculture, she said. Sanitary and Phyto Sanitary Measures (SPS) are requirements applied to agriculture products. The EU has set regulations on SPS requirements on the imports of agricultural products and if requirements are met by exporters, they are issued an SPS certificate. Once the UK leaves the EU, it will have to apply its own SPS framework. SACU and Mozambique have asked for an easy transition while it establishes its own SPS. They want the UK to allow sufficient time to adjust to the UK’s new operational requirements, without compromising requirements met for EU certificates, in order to ensure continuity of trade. Mlumbi-Peter said there had not yet been agreement on the timeframe for which existing SPS certificates granted by the EU would still be recognised by the UK. Government wants Parliament to ratify a trade arrangement with the UK next week. Barring that, a memorandum of understanding will be developed and would apply for six months following Brexit. 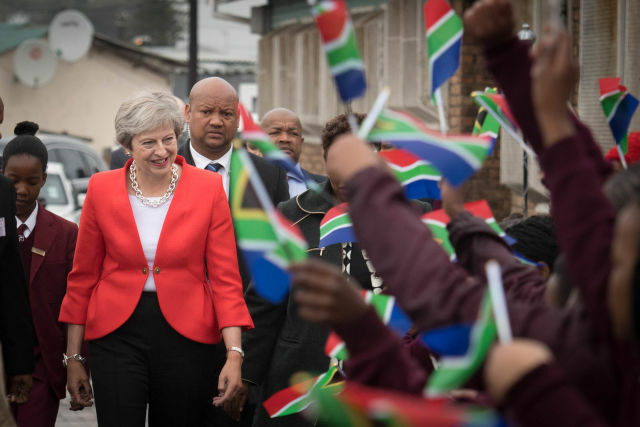 If that fails, SA will then ascribe to a new tariff schedule the UK published on Wednesday for its trade partners for 12 months as it completes its transition out of the EU, Trade and Industry Minister Rob Davies told journalists at a briefing on Wednesday afternoon. A no-deal Brexit means countries trading with the UK would have to revert to tariffs set out by the World Trade Organisation, some of which are higher than existing trade agreements, Davies said.